Yesterday i rode downtown for the 11:00 AM showing of Cloud Atlas, the movie made from David Mitchell’s magnificent eponymous novel. As it started running, i was entranced by how perfectly the directors (Tom Tykwer and Lana and Andy Wachowski) were depicting the visual aspect of the novel. Mitchell broke the novel into six story lines, presenting the stories in chronological sequence, as i described in my paragraph on this novel in my 2012 Reading section. The directors broke these story lines into several sections each and interwove them, and i suspect that this made the movie more difficult to follow than the novel even though their intent was to show more closely how the stories were interrelated. The directors also added material not in the novel, and i saw almost none of that to be an improvement, most especially the tear-jerker ending. The movie is certainly worth seeing, but think you’d have to be a lot smarter than i am to follow it if you were not familiar with the novel. In any case, read the novel. 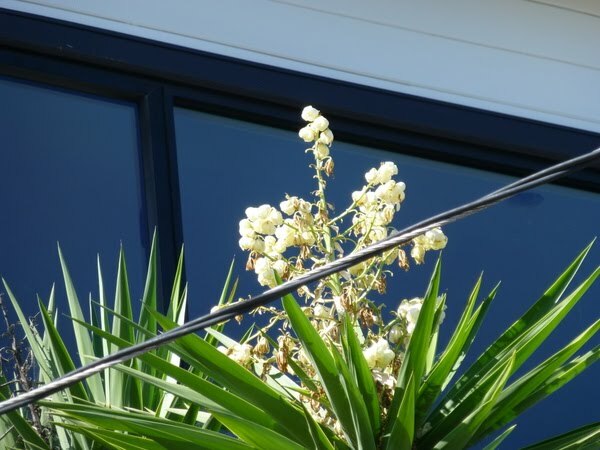 Here’s a tree yucca (perhaps Yucca filifera) blooming on Noe Street. A cursory search failed to turn up the species with much confidence.